The incredible instant bag organizer with a LED lights! The Kangaroo Keeper Brite the incredible instant bag organizer with a LED lights! 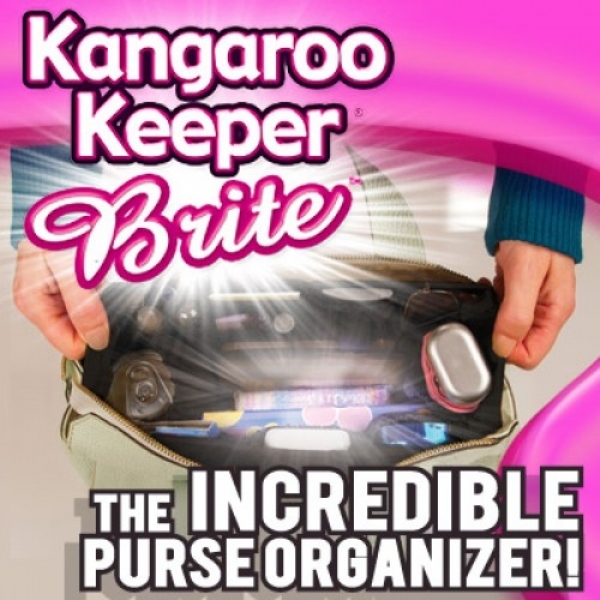 Kangaroo Keeper Brite as seen on TV helps you organize your bag or purse in MINUTES and features a LED light that illuminates the inside of your bag helping you find what you need. Includes: 1 Large 3"x10"x6", 1 Medium 3"x8"x6". This is a replacement purse organizer from one I purchased from a large retailer a couple of years ago, but this is an improvement because of the light. The compartments are arranged a little differently (i.e. could use less room on the elastic areas on the side and more compartments on interior) but overall the size is perfect and I absolutely love the light. Its not great for a hobo type bag, just a regular purse as its small in size, but it holds a lot. The light is not made very well, but don&apos;t worry to use it much. Overall, I&apos;m glad I have it, its been worth the money I spent, and don&apos;t have to hunt for things I need when I know exactly where they have been placed. Thanks for creating something so practical, don&apos;t know how I managed without it. I have been looking for something like this for a while. It&apos;s perfect. i thought it was going to be a little bigger, but it is okay, i need to stretch it out some more. Truly an organizer. Lots of secure pockets. I find it handy to move from purse to purse. Since they come in twos, I have one to a friend. Great product.